Today Reedy Creek State Park is part of the William B. Umstead State Park. The existence of two separate entrances to the park are the remnants of the park's history during racial segregation. The park was created on April 24, 1950 with 1,234 acres from the southern end of Crabtree Creek State Park. And although it was designated at that time as the state's second state park exclusively for use by African Americans, Crabtree Creek State Park had for many years operated with two entrances, one for blacks and one for whites. When Reedy Creek was created, Crabtree Creek became the park for whites. Park brochures would make the segrated distinction until 1965. In 1955, Crabtree Creek State Park was re-dedicated and renamed for conservation advocate Governor William B. Umstead, and in 1966 the two separate parks were united into one park, William B. Umstead State Park. "State Leads in Acreage Acquired by Rural Resettlement Administration." Gastonia Gazette (Gastonia, N.C.), November 20, 1936. North Carolina Department of Conservation and Development. North Carolina Resources. 1952. http://digital.ncdcr.gov/cdm/ref/collection/p249901coll22/id/80397 (accessed January 19, 2016). North Carolina Division of Parks and Recreation. North Carolina State Parks [brochure]. 1954. http://digital.ncdcr.gov/cdm/ref/collection/p16062coll9/id/215048 (accessed January 19, 2016). North Carolina Division of Parks and Recreation. North Carolina State Parks [brochure]. 1957. http://digital.ncdcr.gov/cdm/ref/collection/p16062coll9/id/215013 (accessed January 19, 2016). North Carolina Division of Parks and Recreation. North Carolina State Parks [brochure]. 1959. http://digital.ncdcr.gov/cdm/ref/collection/p16062coll9/id/215081 (accessed January 19, 2016). North Carolina Division of Parks and Recreation. North Carolina State Parks [brochure]. 1961. http://digital.ncdcr.gov/cdm/ref/collection/p16062coll9/id/214939 (accessed January 19, 2016). North Carolina Division of Parks and Recreation. North Carolina State Parks [brochure]. 1965. http://digital.ncdcr.gov/cdm/ref/collection/p16062coll9/id/214978 (accessed January 19, 2016). 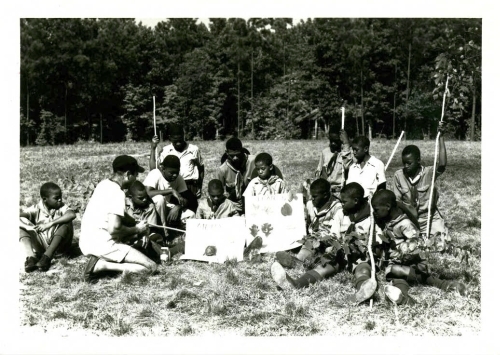 [Boyscouts learning about native plants and animals, Crabtree Creek State Park.] Photograph. ca. 1940s. http://digital.ncdcr.gov/cdm/ref/collection/p16062coll27/id/178 (accessed January 19, 2016).